It is one thing to ask whether a county’s air quality is good, and another to ask if it is so bad that it is unhealthy. The previous post focused on good air quality days. This post focuses on the percentage of days with unhealthy air quality. I looked at data from the EPA’s Air Quality System Data Mart for 20 Missouri counties. The data covered the years 2003-2014, plus the years 1983 and 1993 for a longer term perspective. For a fuller discussion of air quality and the data used for this post, and a map of the 20 counties, see my post Air Quality Update 2014. The EPA data distinguishes 4 levels of unhealthy air: Unhealthy for Sensitive Individuals, Unhealthy, Very Unhealthy, and Hazardous. No Missouri county is reported to have Very Unhealthy or Hazardous air quality for any of the years I studied. The graphs on the right show the percent of monitored days for which air quality was either Unhealthy for Sensitive Individuals, or Unhealthy. The first chart shows a group of counties along the Mississippi River north or south of St. Louis. The second chart shows a group of counties in the Kansas City-St. Joseph region. The third chart shows a group of widely dispersed counties outside of the other two areas. (Click on chart for larger view). 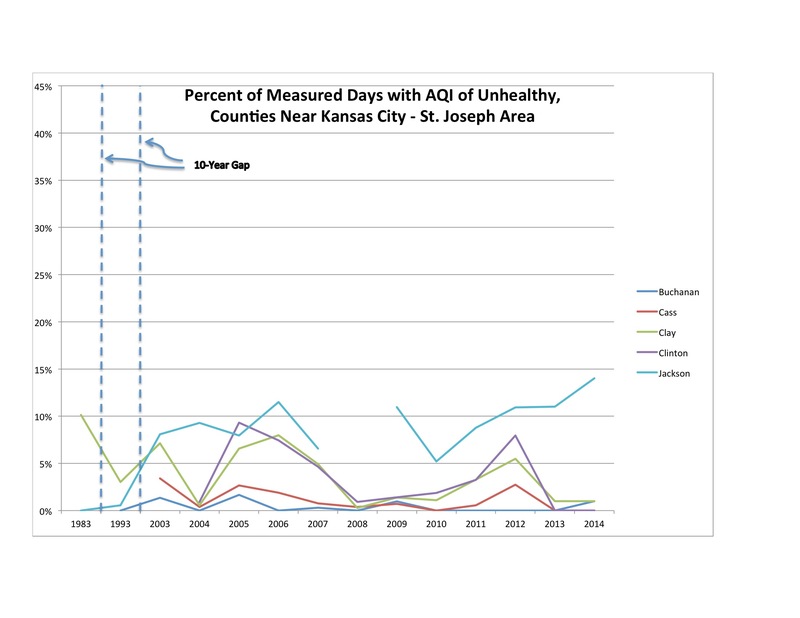 The percentage of unhealthy air days was 2% or below for all Missouri counties except one: Jackson County (the location of Kansas City). 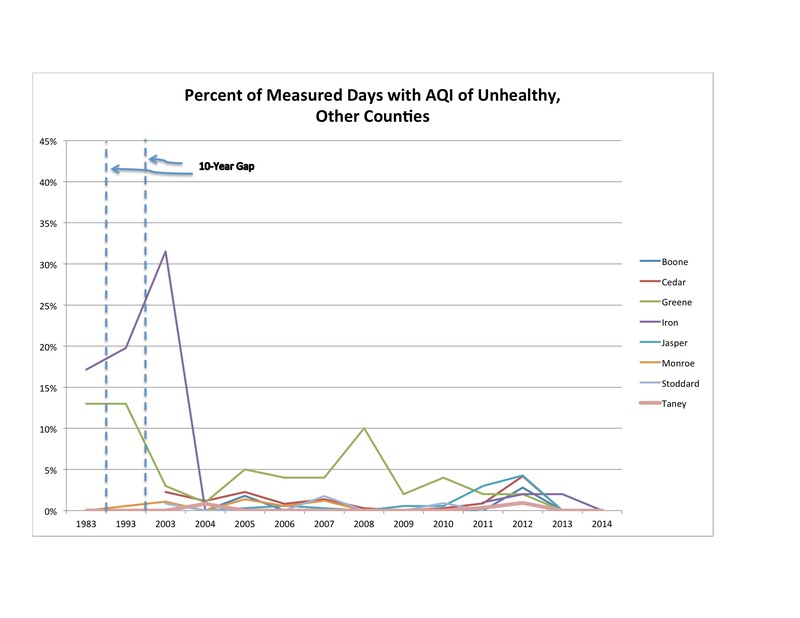 There were no unhealthy air days at all in 15 of the 20 counties. The percentage of unhealthy air quality days increased in only two counties: Jackson County and the City of St. Louis. The percentage of unhealthy air quality days was 14% in Jackson County, making it by far the worst performer in the state. No other county had more than 2%. 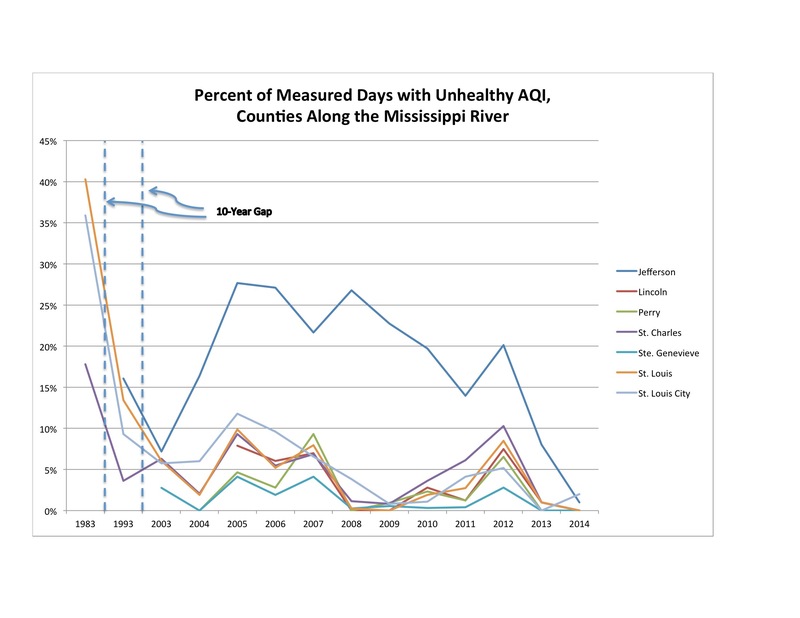 This is the second year in a row that Jackson County has had the most unhealthy air days, and since 2011 the trend has been upward. It is heartening, and good for the lungs too, that only one county in Missouri had a significant fraction of days on which the air quality was unhealthy. The state clearly has improved its air quality. It is equally clear, however, that in Missouri’s two largest metropolitan areas, air quality is not yet good on the majority of days. Environmental Protection Agency. Air Quality Index Report. This is a data portal operated by the EPA. Data for 2014, Missouri, and grouped by County downloaded on 11/6/2015 from http://www.epa.gov/airdata/ad_rep_aqi.html. By mogreenstats in Air on 2015/11/19 .